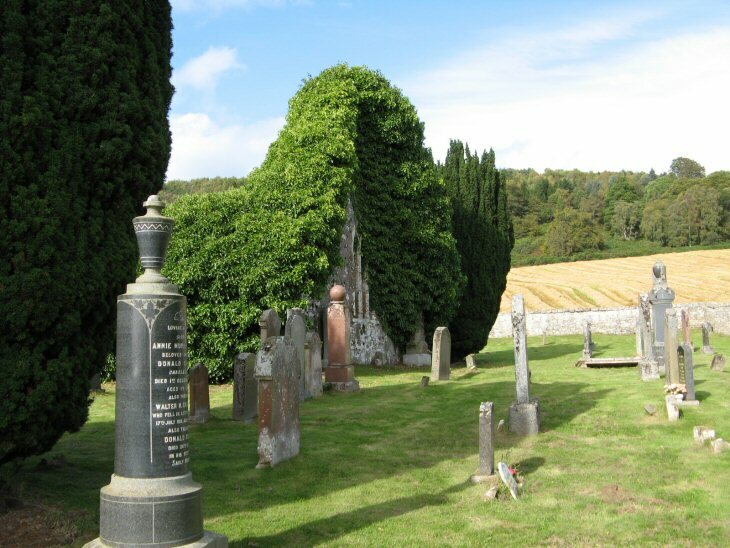 Ross & Cromarty Roots | Kilmuir Burial Ground. Another Black Isle burial ground with fine sea views and surrounded by attractive countryside. The ruins are of a 15thC church, which was superseded in the 18thC by Knockbain Parish church (itself now abandoned). The eastern part of the ruin is occupied by an inaccessible vault of the Grahams of Drynie. My wife is a decendant of the Grahams of Drynie - we would like to visit the vault sometime - how inaccessible is it? Added by Keith Cook on 24 June 2009. Hello Keith, the building has a metal bar door with a rusty lock as I recall. Doubt it's been open in many years. Suggest you contact the Highland Council who maintain the churchyard...they may know of the family contact, if there is one. Added by Roddie on 24 June 2009. Have just found that Kilmuir Wester was joined with Suddie to form Knockbain and the above photo shows a quiet resting place and well looked after. I have a John Forsyth b.1798 there and parents Alexander Forsyth & Elizabeth Graham, but no details have I found, she may be related to the Graham family mentioned. Added by Barry Smith on 20 February 2010. I am a descendant of one of the Noble families who lived in this parish. Have any of the Monumental Inscriptions been recorded ? Added by Elizabeth Darby on 09 December 2011. I am a descendant of Hugh Halkett (1783-1863). His second wife, Margaret Graham, apparently placed a fine monument to him - and to her first husband Sir Michael Clare of Jamaica - in the family burial place at Drynie. Does anyone know if there is a tombstone in the vault, or the burial ground. And has anyone accessed the vault in recent years? Margaret died and was buried in Celle, Hannover. Added by Jane Allen on 27 April 2012. I know that many Logans or Lobans wre burried at Kilmuir but that their stones are no longer readable. Is there an old listing available? Added by John MacLennan, Chicago on 09 July 2012. Not as far as I know, John. Added by Roddie on 10 July 2012. We've just been to Kilmuir because my McLennan great grandparents are buried there, though the grave was covered by ivy. We're just getting to grips with my family history. We would like to know more if anyone is able to help. Added by Enid Pryce-Jones on 31 July 2012. Hi Enid, If you contact Clan MacLennan on www.clanmaclennan-worldwide.com, we should be able to help. Added by Bruce McLennan on 17 August 2014.